Well, it’s true … we have now ventured into my very favorite of books, “Steampunkery!” I just love this book. In case you missed it, the first tutorial from this book was featured on Tuesday, make sure you get the tutorial here and get your projects posted to the FaceBook Page or the Pinterest Board. 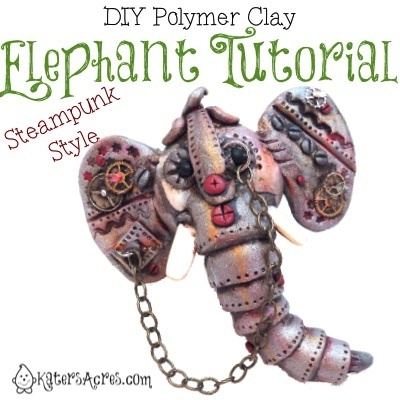 For the complete tutorial, please see Christi’s Steampunkery Book starting on page 74 for the “Mammoth” Tutorial. First, condition your clay by creating a signature “Lookat Blend” in the Christi Friesen style. GO HERE to get the instructions on creating this blend. Once you have created the blend that’s perfect, stripy, and “interesting” roll it into a sheet on the thickest setting of your pasta machine. Divide that sheet in half. NOTE: You will use half to make your elephant’s head and the other half for details like ears, eyes, trunk, & hair should you choose to add it. Roll a ball about the size of a walnut and gently flatten it to your work surface. Next, roll two little balls from the other sheet (about pea sized) and place them on the head. Insert your elephants eyes using this method. Now follow Christi’s Instructions in her book to make your elephants ears. Once you have made your elephants ears, add tusks. I’ve used quartz stick bead for my elephant, I thought they looked like ivory. Then make your trunk by making a tapered log and attach it. NOTE: It is easier to attach the trunk after you have detailed it. When you are done adding your Steampunk gears, gadgets, & gizmos it’s time to finish your piece. NOTE: I used a dark brown, “Dark Umber.” It is not as harsh as black, but still adds the “punch” that my piece needed. I also added hints of a reddish brown color I made myself by combining red & light brown acrylic paints as it made a nice contrast to the copper clay I blended.